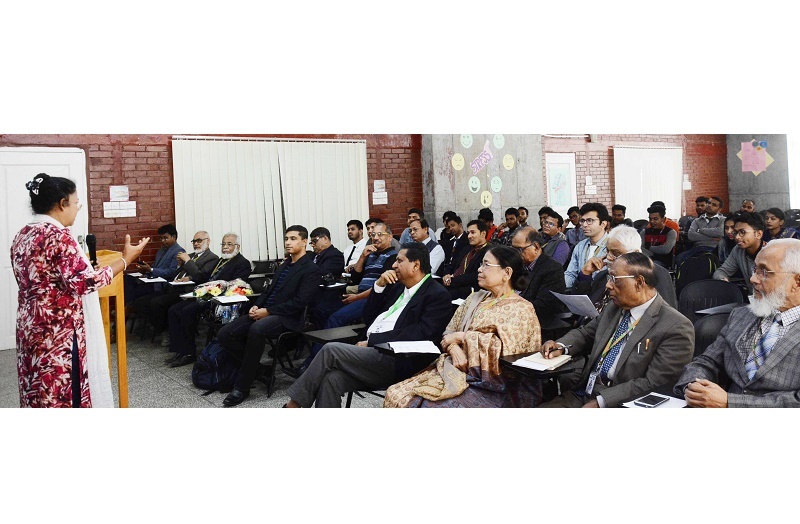 A seminar on Sustainable Development Goal: SDG 9 Industry, Innovation, Infrastructure held at IUBAT on February 27. The program was jointly organized by Centre for Global Environmental Culture (CGEC) and International Program of IUBT. The speakers of the seminar were Dr Golenur Huq, IT specialist and faculty member of Western Sydney University, Australia and Taofiq Huq, space engineer and PhD researcher of University of New South Wales, Australia. Dr G Huq in her presentation shared her research findings on "Fall monitoring system for elderly people" by using developed software and possible use of this software in Bangladesh for monitoring health of isolated elderly people. T Huq in his presentation explored how modern technologies could enable individuals to positively impact environment in a sustainable way by building computers for Earth observation satellites to make it available for the poorest farmer. IUBAT Vice Chancellor Prof Dr Abdur Rab presided over the seminar while CGEC members Dr Muhammad Rehan Dastagir delivered the welcome speech and Dr Ferdous Ahmed delivered the vote of thanks in the program. Students, faculty members, chairs and dean of the various colleges were present in the seminar.